What is the optimal route for my cable? Is my cable laying plan feasible? Can I accurately control cable tension? What do I need to monitor during the lay? What are the costs versus performance? Makai answers these questions regularly for our clients as a trusted adviser during our more than 35 year experience with submarine cables.  Our services are grouped into three categories for clients aiming to plan, simulate, and install submarine cables. Screen capture of Makai’s GIS cable planning software used to generate constraint maps and evaluate submarine cable routes. 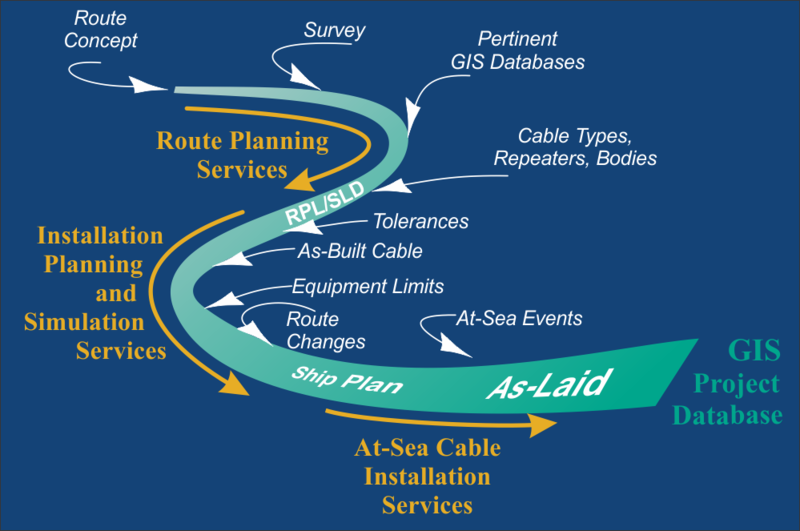 Makai offers submarine cable planning services to assist cable owners and planners in the preliminary stages of cable route planning. Makai uses GIS software, MakaiPlan, to integrate all available GIS data into detailed maps in order to investigate cable route options. The route position list (RPL) and cable assembly/single line diagram (SLD), are prepared and can be provided to cable manufacturers for preliminary cost estimates. 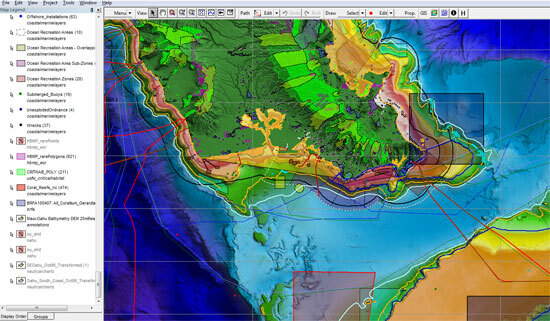 The GIS data can be made available to the customer in a variety of different formats for use in GeoMedia or ArcGIS. Makai can also provide specifications for the bathymetric survey that will need to be completed prior to the final cable design. Makai engineers can act as owner representatives onboard the survey vessel during at-sea operations to be certain that the data collected matches the specifications of the contract. Makai has the software tools necessary to process the survey data files and assess the quality of the data collected. Makai engineers have also acted as expert witnesses during environmental impact study hearings and press conferences for new submarine cable projects. 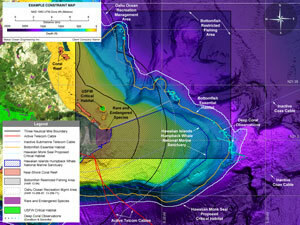 Example map showing bathymetry, aerial imagery, active and inactive telecom cables, critical and essential habitats, marine sanctuaries, restricted fishing areas, recreation management areas, shallow and deep water coral, and endangered species. Makai conducts desktop studies for preliminary submarine cable route selection. These studies provide an understanding of the technical and economic feasibility and risk factors of the project prior to investing in large offshore surveys or detailed engineering designs. 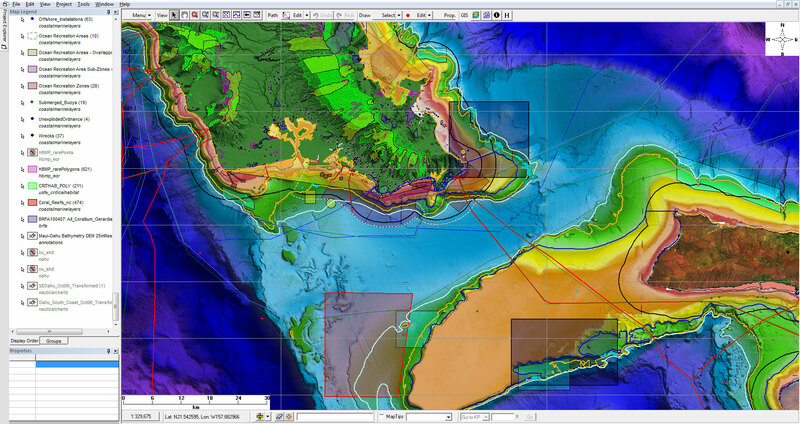 During a typical study, Makai conducts a search for available data for a particular site, including bathymetric data, meta-ocean data, GIS spatial data, and nautical charts. Using all the available data and Makai’s experience in submarine cable route design, constraint maps are created and potential route options are selected. The final report typically consists of multiple sections including: route description, which includes RPLs, depth and slope profiles; bathymetry; geology; fisheries; environmental conditions; hazards and obstructions, and landing sites. Results can be presented as GIS databases and custom high-quality offshore charts that can be used in later stages of the project. 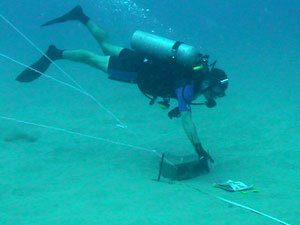 Diver conducting a landing site survey in 60 feet water depth. Makai conducts shore landing site surveys for submarine telecommunications and power cables. The purpose of the site survey is to locate a suitable exit site for horizontal directional drilling operations. Depending on the seafloor characteristics of the site, a diver may be towed over an area defined by preliminary results from the desktop study. At the exit point, the goal is to locate a sand channel which has unencumbered access to deep water for the cable to follow and possibly be buried. The site is documented by pictures, videos, and the depth of the sand up to two feet. Screenshot of planning a submarine cable route in fixed mode which will only allow a change in slack; the cable distance will not be affected. This is used for making changes to the route after the cable has been manufactured. Situations arise that necessitate a change in the cable path after the cable has been manufactured. Makai can make changes to the cable route after the cable has been manufactured by using a special “fixed cable mode” in MakaiPlan which allows changes to the position of the route and slack without changing the length of the cable segments. This is important when the cable has already been manufactured and changes to its length cannot be made. 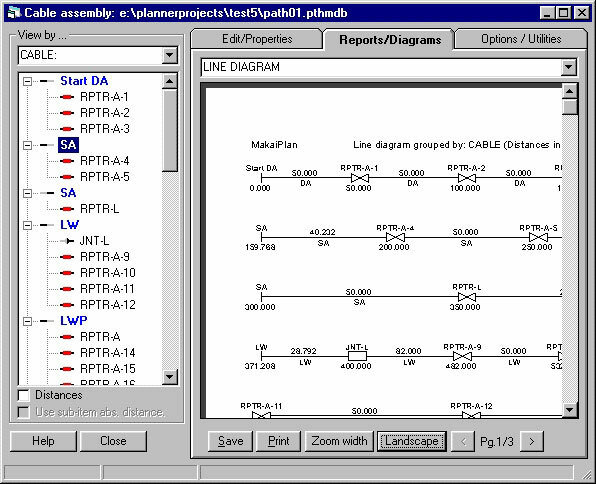 Screenshot of the cable assembly and SLD in MakaiPlan. Makai can design the cable assembly to be installed on a selected cable route. In the design of the cable assembly, Makai will consider constraints such as changing the cable type based on depth and bottom roughness, changing bottom slack based on terrain roughness, and planning the landing of the repeaters in reasonably flat portions of the route. At the end of this work, Makai will produce a Single Line Diagram (SLD) with all the cable type lengths, cable transitions and in-line bodies. In general, the Cable assembly design is completed simultaneously with the cable route planning, especially during initial stages before the cable is manufactured. At the end, a Route Position List (RPL) that combines the route as well as cable assembly information will be created. The MakaiPlan software is equipped with a feature that can produce a preliminary cost estimate for the cable and the installation process. This estimate will be based on the unit costs of cable, repeaters, daily ship rates for installation and burial, and other parameters affecting the installation time and laying speeds. 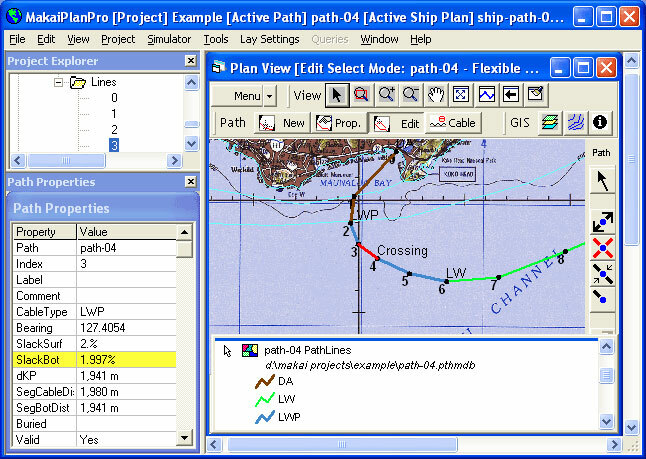 Upon client request, Makai can run the MakaiPlan software to produce such an estimate for a given cable route. While these estimates are very preliminary, they can used to perform initial cost-benefit analyses on various design options in the project planning phase. Makai’s technical staff have deep theoretical and practical knowledge of cable installation and retrieval, towed arrays, drag arrays, tow fish and anchor deployments. 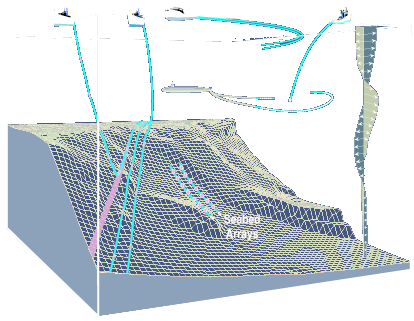 Using the advanced simulation features in MakaiPlan Pro, Makai has run customized simulations to answer specific questions about installations of seismic arrays, power cable lays, communication cable deployments, branching unit installations, cable repair operations and towing of arrays by surface and underwater vehicles. Makai can perform accurate simulations to determine the feasibility of the given cable installation, taking into account ship and other equipment limitations as well as the expected environmental conditions. Simulations can be run to include typical at-sea instrument and operator errors. 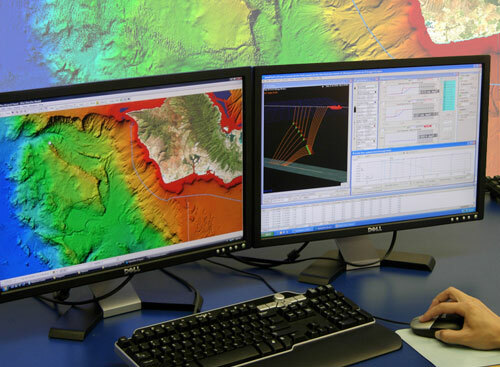 Instruments errors such as GPS position errors, cable length measurement errors and errors in the knowledge of the ocean currents and bathymetry can be easily incorporated in the simulations. 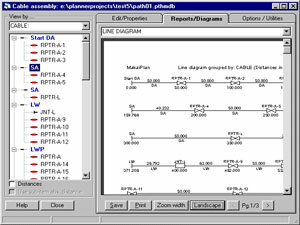 Operators errors such as how well the DP and cable engine operators can follow the instructions can also be incorporated in the simulation. Using the results, we can perform an error budget analysis and determine the factors that are limiting the operation. 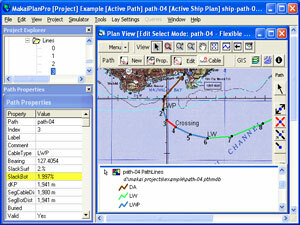 These computer simulation realistically reproduce actual at-sea lay conditions and allow the planner to estimate the probability of success to achieve the desired cable touchdown positions and the cable slack (or tension) at the seabed. Any potential installation problems can be found during these simulations, and corrected before they become costly mistakes during the actual at-sea installation. Answering these questions allows us to present the client with a trade-off analysis of equipment costs vs. accuracy achieved and risk minimization. In addition, we may help clients with deck layout, peripheral equipment selection, and operational procedures when requested. Cable engine payout rates during the lay (to install the cable on the seabed at the location and slack/tension conditions required by the Route Positioning List (RPL)). The ship plan will include all the vessel speed control for each cable type being deployed as well as speed changes required to prevent cable suspensions on the seabed, changes in cable payout rate in order to properly achieve the required seabed slack at all times during the lay, maximum turns the ship can comfortably perform, etc. The ship plan will also take into account the cable dynamics, such as those that occur during cable type changes, ship speed changes, deployment of repeaters or ship alter-courses. The end result is a final Ship Plan: a detailed set of ship and cable payout instructions to be used for a successful cable lay. Lease or sale of our software products: MakaiPlan, MakaiPlan Pro and MakaiLay. Makai can perform a post-lay analysis using the raw instrument data collected at-sea. At the end, the final as-laid condition of the cable (i.e., final touchdown conditions and slack/tension distribution) will be created for the record and any potential problem areas will be identified for future maintenance. Training facility at Makai Research Pier. 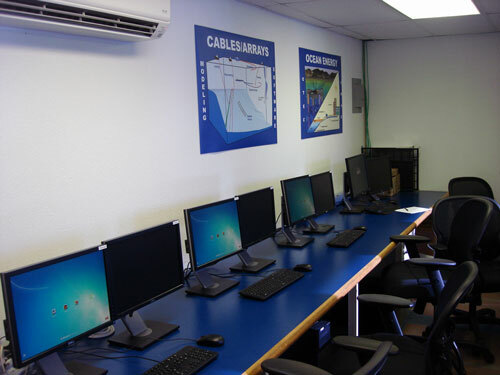 Makai maintains a state-of-the-art computing facility to provides hands-in training in MakaiPlan, MakaiPlan Pro, MakaiLay, and other submarine cable repair and seismic software at Makai Research Pier in Waimanalo, Hawaii . The facilities have six dedicated dual-monitor workstations that can accommodate 6 personnel. Comtrol DeviceMaster Ethernet Device Servers provides the ability to mimic shipboard communications from the GPS, gyro, roto, USBL, sounder, and plow to provide a realistic “at-sea” MakaiLay training environment. Makai can also provide training at the client facilities. Training typically last 3 days for MakaiPlan and 5 days for MakaiPlan and MakaiLay. An operator who has successfully completed Level 1 classroom training for the MakaiPlan Submarine Cable Planning and Simulation Software but has limited operational experience. An Advanced Operator must have the following qualifications: successful completion of MakaiPlan Pro Level 1 training; have consistently used MakaiPlan Pro for at least one full year, successful completion of a 4-day Advanced MakaiPlan Pro Level 2 operations class, and success in passing the Advanced MakaiPlan Pro Level 2 operator test. An operator who has successfully completed level 1 classroom training for the MakaiLay Submarine Cable Installation Software but has limited, or no, at-sea MakaiLay operational experience. A Standard Operator must have the following qualifications: successful completion of MakaiLay Level 1 classroom training, at least 6 weeks of at-sea MakaiLay operational experience supervised by a standard or Advanced MakaiLay Operator, successful completion of a 3-day Standard MakaiLay Level 2 operations class, and success in passing the Standard MakaiLay Level 2 operator test. Standard MakaiLay Operators are capable of operating MakaiLay, transferring the data to the EIC, and assisting the EIC in interpretation of the data. An Advanced Operator must have the following qualifications: successful completion of MakaiLay Level 2 classroom training and test, at least 6 months of at-sea MakaiLay operational experience, at least two MakaiLay installations/commissionings, successful completion of a 3-day advanced MakaiLay operations and troubleshooting class, and success in passing the MakaiLay Level 3 operators test. Advanced MakaiLay Operators are capable of operating MakaiLay, interpreting the results, and supporting the EIC in making changes to the cable lay parameters in order to maintain quality cable installations.